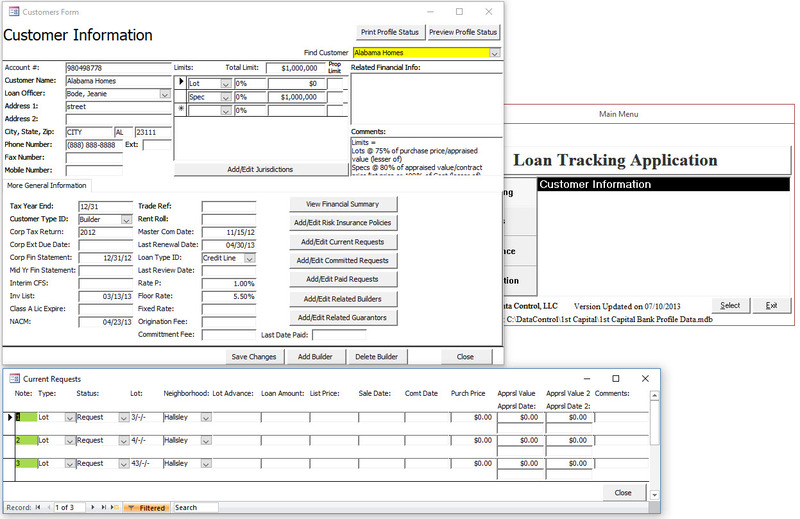 Recently we’ve been asked by a number of clients including Roofing Consulting Services (Consultants, Richmond, VA), KnoxMarine (Surveyors, Charleston, SC) and Hirschler Fleischer (Attorney, Richmond, VA) to integrate Access with Word. 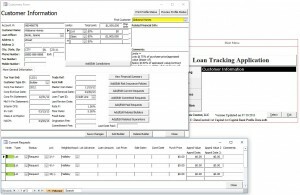 What these companies have in common is that they produce reports to their clients and they want to both standardize the reports across their company and save their report writers time in producing these reports. 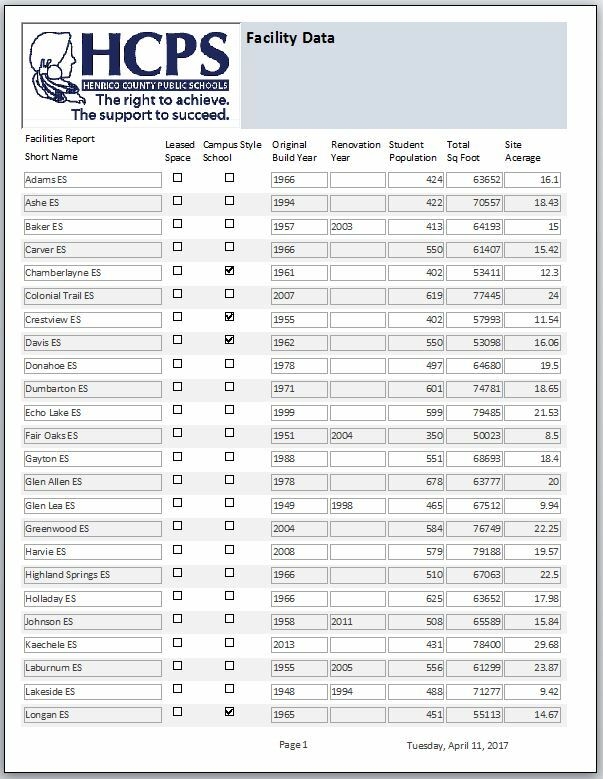 A side benefit is that all of the necessary data to create the report is now consolidated in the Access Database. 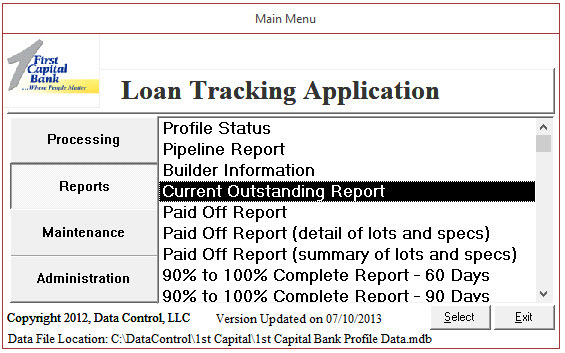 Lastly, because we are using Access to determine where Word Template files are held and where the destination reports go (and how they are named), Access is actually functioning as a light document management tool for the entire report creation and management process. 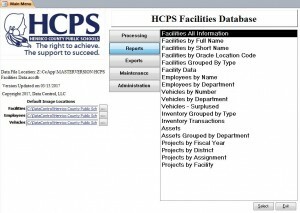 We accomplish this in Access by using a combination of file system objects (you’ll need to register the library in the access modules) and the Word Object Library (you’ll also need to register this. 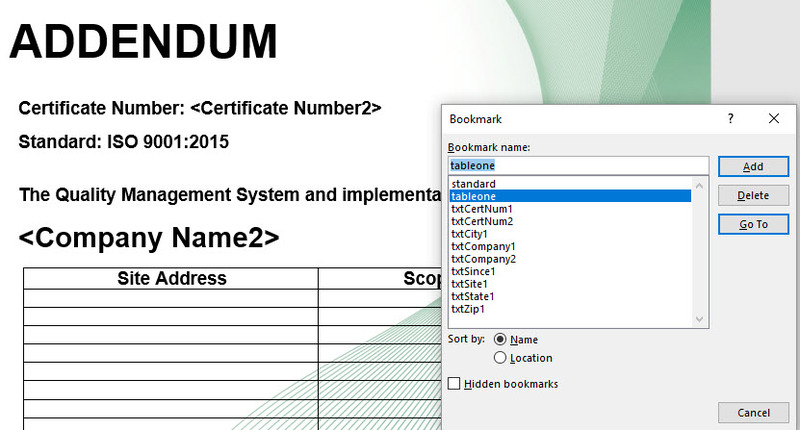 We extensively use bookmarks throughout the various Word documents and create .doc or .docx ‘template’ files. 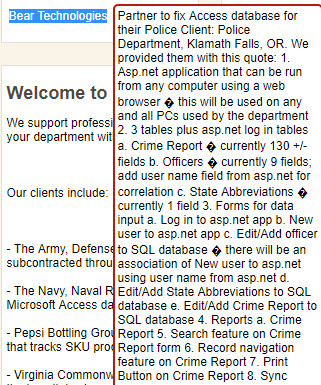 These are NOT the Word Template files. 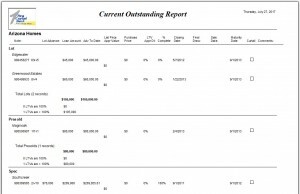 They are standard word document files we name ‘Report 1 TEMPLATE.docx’ for example. If the user wants to change their template files, they simply open them and change them, taking care not to bother the highlighted bookmarks. Throughout 2017, we were approached by a number of clients including KnoxMarine (Charleston, SC) and SeniorSmart (Sykesville, MD) to fix their ‘Cloud’ Access databases. They were both using Microsoft Cloud to hold their Access Database files and were very disappointed with the results. 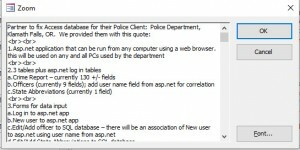 Primarily because this cloud solution creates a temporary copy of the Access Database on the local workstation, then overwrites the cloud version when the file is closed. This, of course, means that if two users have the database open simultaneously, when the second user closes their version of the database, the first user’s database changes will be overwritten. 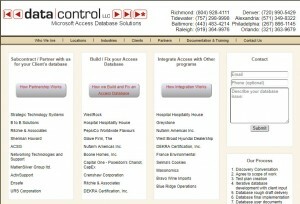 So what is a true Cloud Solution for an Access Database? 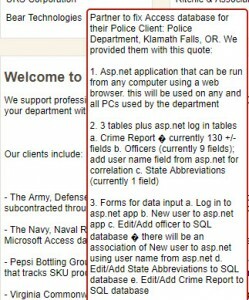 Then Answer: SQL Server or MySQL. 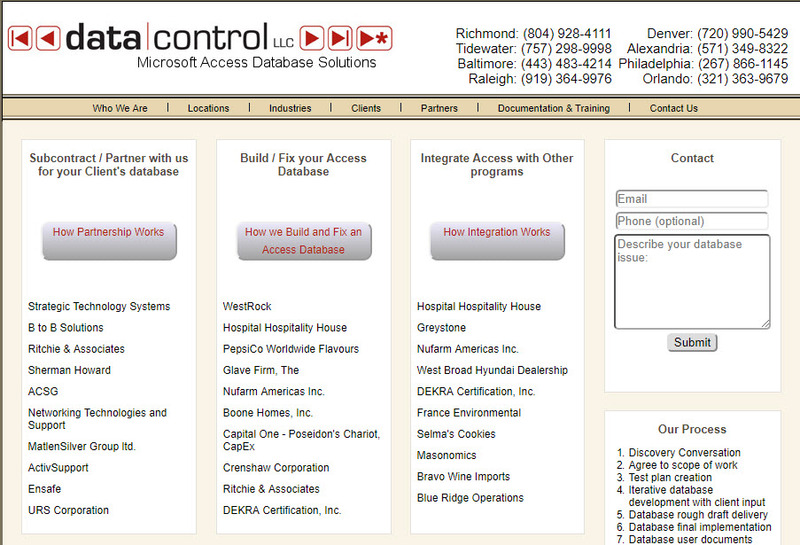 If you’d like us to host your database in our cloud, we’ll convert your database for free. 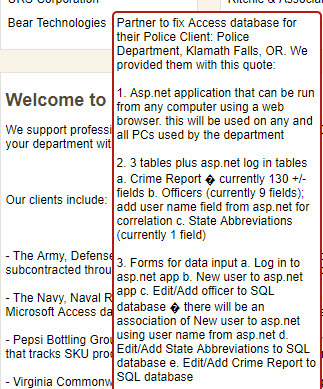 If you want to host your database somewhere else, we’ll give you a price to convert the tables for you and modify your Access Database to use the new tables. 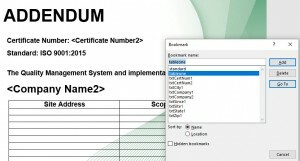 Posted in Uncategorized	| Comments Off on Access Database in the Cloud? 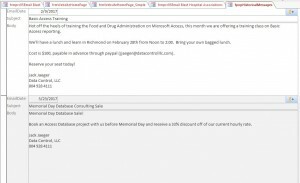 So you have a list of emails and you want to keep in contact with folks easily. I do this by periodically sending out emails to my former clients and offering them incentives to come back and purchase again. Since I already have their contact information in our Access Database for Invoicing, it makes sense to email them from here as well. 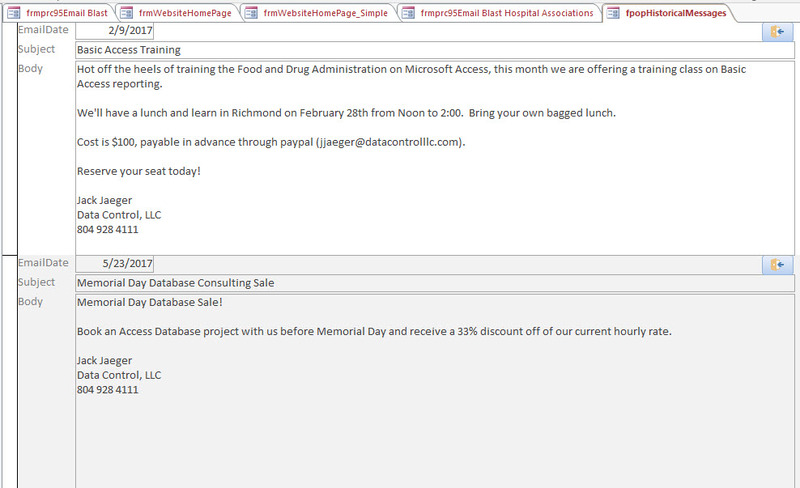 This is an example of an Access Database that interacts with Outlook using Automation and VBA Code. 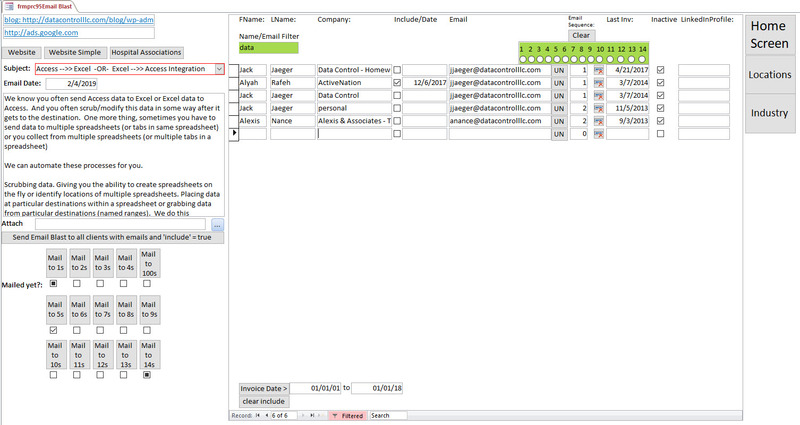 On the left hand side I’ve created buttons for emailing groups of people based on their email sequence. When you’ve chosen the group of people to email (keep the groups small so you aren’ considered a spammer) and you’ve chosen your message, you may then email the group by choosing one of the ‘Mail to…’ buttons. 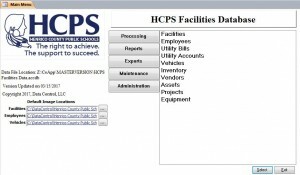 We’re particularly proud to work with one of the best counties in the United Stated (and the home of Data Control, LLC!) 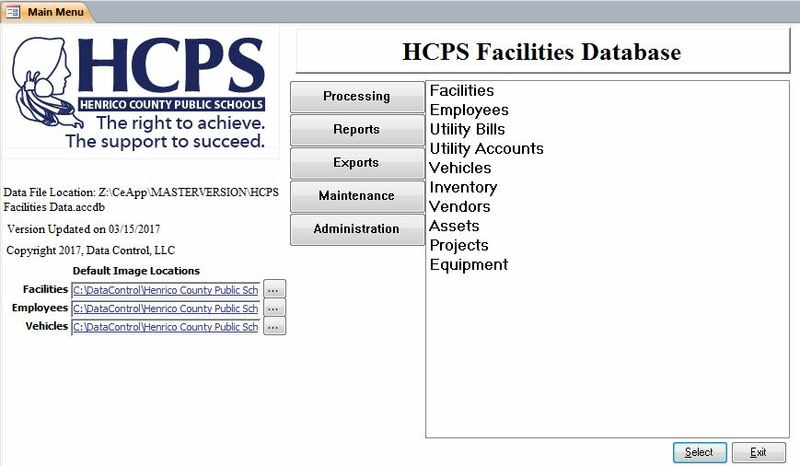 We have built and implemented an Asset / Facility / Project tracking database for Henrico County School Systems. 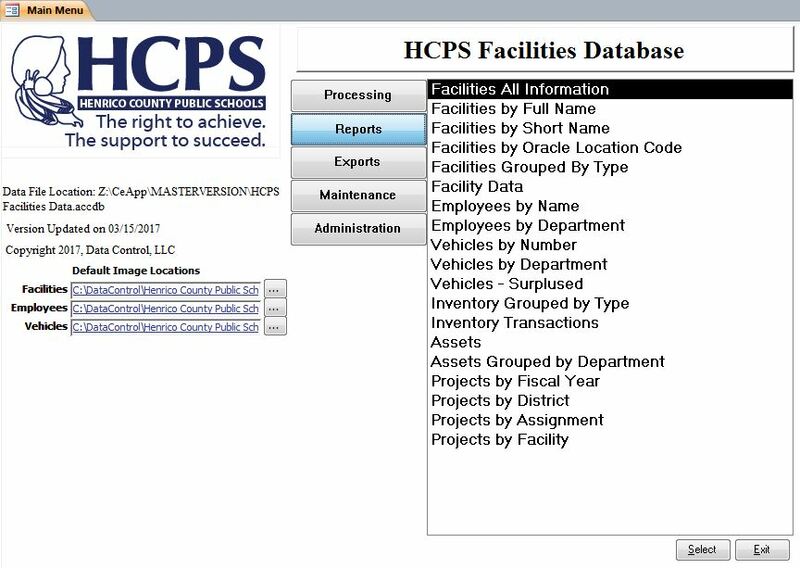 If you’d like a demonstration of this database to see if it would work for your County, then please call us and set up a shared view session to see a demonstration. So you are running 20 lines of production and you have 3 shifts a day. But some times you don’t run a shift due to a variety of reasons. 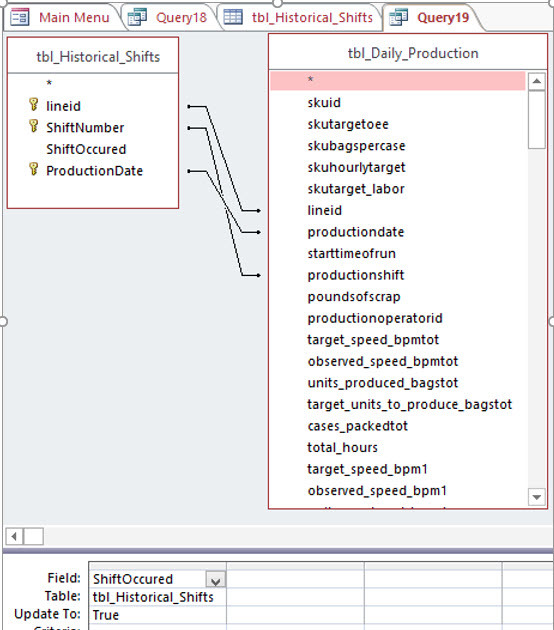 You decide that during these missed shifts you want to record a shift that SHOULD have run and give that shift a downtime code. You want to use ‘No Demand’ as your downtime code which means that there was no reason to run on that day on that production line during that shift. 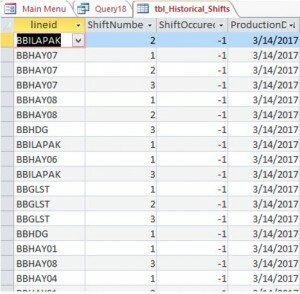 By having this ‘No Demand’ data added to your production run data, you’ll be able to more accurately track your efficiency, downtime, and more. 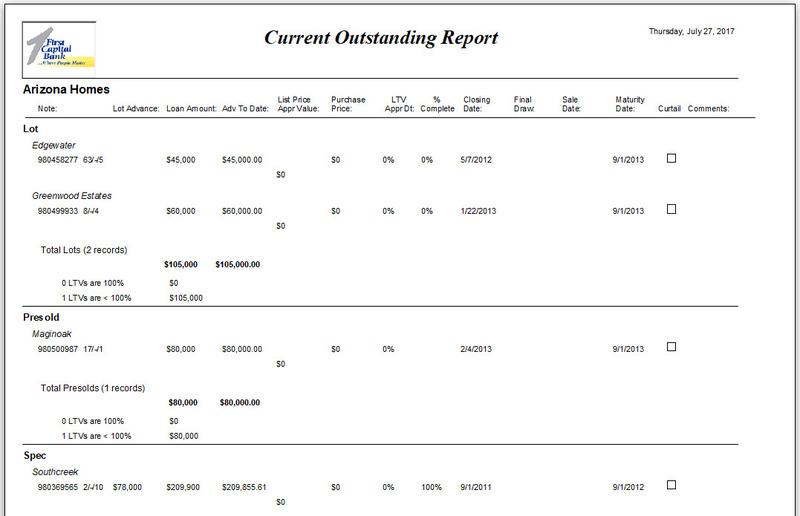 So how do you identify where these holes are in your data and how do you fill these holes? You’ve got 20 machines times 3 shifts a day. That’s 60 potential holes to fill. Here’s how I approached. 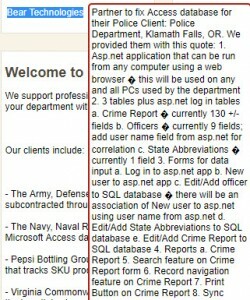 Note that the two currentdb.execute “…SQL Code Here…” statements (at the end of the procedure) are creating records. One in the production table and one in a tsub downtime table. Call me at 804 928 4111 with any questions if you want to get this code working for you. 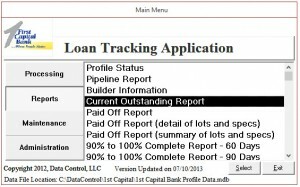 In code I create this table with a currentdb.execute SQL statement. I put this inside of a For/Next loop that is defined by the most recent date in the table up until today. Therefore I will only have to add the most recent days everytime I run this code. Note above that I assume the ‘ShiftOccured’ field is false. Therefore I assume that none of the shifts actually ran. 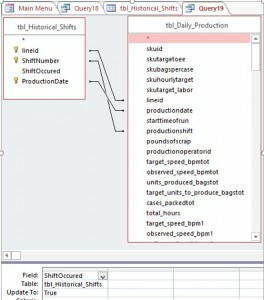 For example the production line BBHAY31 on shift 3 and the BBTUB on shift 2. 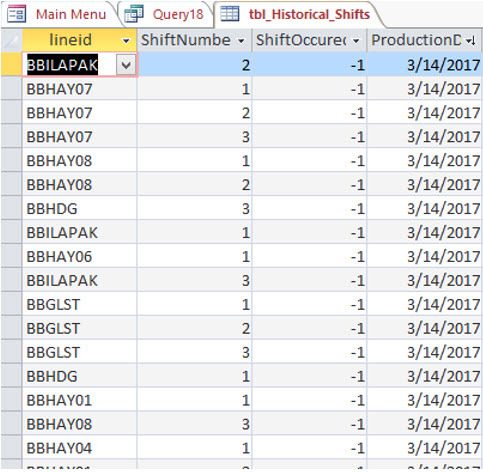 So now I create a recordset based on the above table and scroll through that recordset identifying the ‘0’ values in ShiftOccured. 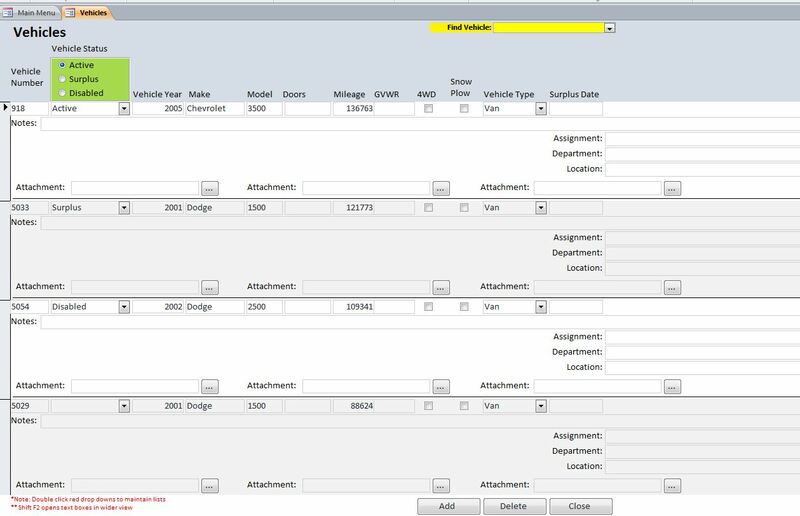 I then put this sub procedure (subCreateNoDemandRecords) in a global module so it may be called from anywhere in the database including this new button.